Looking for cheap ways to promote your business or product? There are countless ways to advertise your small business on a small budget. As the CEO of a small business, have you ever felt daunted by the idea of establishing a name for yourself? In a market where the big dogs are spending millions of dollars a year to interrupt people and put their names in front of the masses, have you ever thought it impossible to gain attention? I know I have. What we lack in capital, we have to make up for in creativity, tenacity and effort. We have to hustle harder than everyone else out there. We have to be the champions of our cause - day in and day out. We have to be remarkable. Instead of spending money to interrupt your audience, focus on building the best possible business and providing massive value. If you're great, people will notice and opportunities will appear. 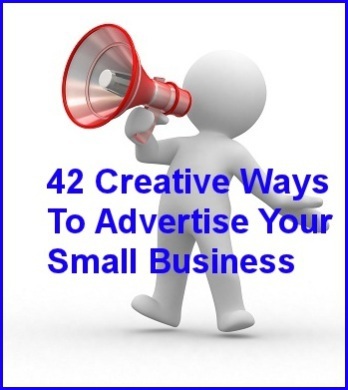 The following is a list of 42 creative ways to advertise your small business on a small budget, but the possibilities are infinte. My goal in creating this list is to spark your creative juices so you can make your small business the best it can be and communicate your message to the audience who needs it most. The list is not exhaustive and I can't cover the how-tos in detail here, but I hope this list can be a checklist to help you find clever and creative ways to get your business or product more attention and customers. Why does your organization exist? What is the purpose of your company? Why should I care? What’s in it for me? If you can answer these questions clearly and concisely in less than 20 seconds, good for you, you’re on the right path. If you’re having a difficult time articulating your purpose, it’s time to get clear on it. If you can’t tell us why you exist or why we should care about your product or service, we’re not going to be inspired to action. Simon Sinek gives a transformational TED Talk about how great leaders inspire action by starting with "Why". The internet is where most people do their research, and being easy to find online is incredibly powerful. With all the tools available today we don’t need any technical know-how to build a website. Most web hosting companies like Host Gator and Blue Host provide dozens of free website templates. If you’re a little more tech savvy I suggest using Wordpress.org. In my opinion, it’s the most powerful blogging platform and provides the most flexibility. To make the process simple, Michael Hyatt put together a screen cast that will show you how to launch a self-hosted Wordpress blog in less than 20 minutes. Use content marketing on your website to cultivate a community that trusts you. “Content marketing is a marketing technique of creating and distributing relevant and valuable content to attract, acquire and engage a clearly defined and understood target audience – with the objective of driving profitable customer action.” I suggest learning as much as you can about content marketing. Consistently create compelling content for your website and delivering value to your audience. Build trust. Do this year in and year out. Give your community the most outstanding content, the best information, your gems of wisdom and they will come back for more. Give, give, give - generosity pays dividends. Build your email list by offering a free piece of content on your website in exchange for first name and email address. Your list your the most valuable marketing asset, and it doesn’t cost a dime. To learn more about building your email list, click here, or do a quick web search for “how to build an email list”. Submit your website to online directories such as dmoz, aboutus.org, the world wide web virtual library, or Yahoo Directory. Sponsor a local charity event, golf tournament, county fair, festival, or any event in your area that will be well publicized. What activities or events are going on in your community? Sponsor a youth sports team or a charity 5k run. You can find bulletin board at your local grocery, library, community center, college campus and coffee shop. Take advantage of digital bulletin boards as well, such as Craigslist or Backpage. Write and send press releases to local newspapers or radio stations. This can lead to great interview opportunities, but make sure to avoid common press release mistakes. Collaborate with complementary businesses in your area to cross-promote one another. You can use coupons, bundled promotions, fliers, website links, social media and anything else your creative mind can dream up. By collaborating you can expand your customer base by reaching someone else’s audience. A great example would be a pizza shop and a video store, if video stores still existed. Simply spamming people with your business card at chamber of commerce meetings and other networking events isn’t enough. Get to know people. Connect with them as a human being. Be genuinely interested in their story, listen to them and care about them. What are their dreams and aspirations? What can you do to help them achieve their goals? Discover what they’re interested in, what makes them tick, and maybe someone will listen to you and care about your story, too. Most of us hate public speaking. Face your fears and do it anyways. If you can’t do this, you’re disconnecting yourself from massive opportunity to share your business and your story to large groups of people. There are organizations actively seeking topic-experts to present to their group. Volunteer. You don’t have to be a professional speaker as long as your information is helpful. The development of any skill in life requires practice. Don’t expect to play like Eric Clapton the first time you pick up the guitar, or shoot like Tiger Woods the first time you swing a golf club. Public speaking is one of the most intimidating skills to develop. No one was ever great the first time they spoke in public, and even the most influential speakers were nervous when they first started. If they can do it, so can you. You’ve gotta crawl before you can run, and you have to fall down a few times before you learn to walk. As this youtube cideo shows. going the extra mile means rendering more service than your customer expects, and doing it with a positive mental attitude. This is the essense of being remarkable - under-promise and over-deliver. Make your customer happy and wow them with extraordinary value. This simple but powerful tactic will bring you the attention of those who can provide you with opportunities to grow. Referrals are one of the best ways to grow your business, and there’s only one way to drastically increase yours – ask for them. Don’t assume your clients will do this one their own. Take initiative, be proactive and build the habit of asking all your customers for referrals. If you go the extra mile and consistently exceed your customer’s expectations, they’ll be happy to refer your product or service to their network. Building trust is the goal of every organization. It’s easier to keep an existing customer than to gain a new one. Make sure your customer experience leaves clients feeling happy, valued and important. Be intentional about this. Trust and attention are your most important assets – nurture them. What are you doing to delight your customers? Offer a free trial, demo or sample of your product or service. Prospect's are more comfortable purchasing something they have been able to experience first. Pay per click advertising is one of the most targeted forms of advertising. It’s relatively inexpensive and can be very effective if you’re strategic about it. Please educate yourself on PPC advertising before jumping into it. Start by reading Copyblogger's "5 Steps To Pay Per Click Advertising That Works." Social media marketing on websites such as Facebook, Twitter, Pinterest and LinkedIn can be quite powerful for advertising your small business, and it won’t cost anything but time and effort. If you’re not a social media pro, there are many resources available to educate yourself about social media marketing. I suggest the Social Media Marketing Podcast from Social Media Examiner and Amy Porterfield’s Podcast on social media. Each of the social media websites have different audiences and strengths and weaknesses. You should do some reaearch in making sure your targeted audience is active in the social media platform you choose. Facebook ads, promoted tweets, LinkedIn ads, Pinads and StumbleUpon’s paid discovery are a few examples. I don’t have personal experience with paid advertising on social media so I can’t speak for its ROI. Make sure to do your homework before jumping in. Guest post for blogs that focus on your industry. Write content about your industry for local publications like small newspapers, magazines, coupon books, trade publications or association newsletters - or write a book. Everyone’s an expert at something. Leverage your expertise by delivering valuable content that helps people in some way. Think about the kinds of questions that your audience is asking, and answer those questions to the best of your ability. As you become more published your name recognition and authority will grow, which will lead to greater exposure. Teach a class. Municipalities hold all kinds of classes for their residents, such as music classes, fitness classes, and how-to classes. Find out if your local government or chamber of commerce holds classes on business ownership, running a business, or anything related to your specific industry. Ask how you can teach a class. Good old-fashioned print advertising. Instead of buying a large ad in the most popular newspaper, consider placing smaller ads in smaller newspapers or other publications such as shopper’s guides or coupon books. Offer coupons on your website, on fliers you post or in coupon books. Research shows that people will go out of their way to use a coupon. People love getting a deal - consumers love bargains. This is a great way to market your business and reward customers. Leverage your website and social media profiles to promote your discount and drive sales. Word of mouth advertising is the most important and effective marketing tool because when recommendations come from people we know, we’re more likely to follow up on it. First, leverage your family and friends. They know you, your offerings, and want to see you succeed. They’ll do what they can to let others know why they should come to you. Second, turn strangers into friends. Engage everyone, even the cashier at the grocery store. A two-minute genuine conversation during checkout and a business card can go a long way. Be aware of natural situations that allow you to share the gift that is your service to people who need it. Trade your services to a worthy organization in exchange for advertising space. You scratch my back and I’ll scratch yours. Find influential bloggers in your industry and ask them to review your products or service. Give them a free product to use and many will be happy to do a review. It’s a win-win – the blogger gets a great piece of content for his website, and you get some publicity with his audience. If you find the right person with the right network, this could end up driving a ton of traffic to your website. Run competitions to create interest and community engagement. Use a great prize to intrigue customers and reward contributors. Volunteer your time, especially in high profile events. Serve on a local board or committee. Help plan, raise money or work in the annual parade or local fair. Donate. Give back. Not only will you be able to advertise that you volunteered for a worthy cause, you’ll meet a lot of new people and build relationships with potential customers, partners and people who will open up doors of opportunity. This seems like a no-brainer but is often overlooked. Every single brochure, email, flier, and all pieces of company literature should include your full contact information including website, email address, phone number and company address. On your website, the contact information should be simple to find. Make it ridiculously easy to get in touch with you. No need for unnecessary barriers. In your ads, speak to one target market only. Focus the message to the target group. Create ads that generate interest and make the customer want more information. Generating a poor response isn’t the fault of the medium; often the problem is the message. Plan, test, reflect on results, and adjust your advertising regularly. Be strategic about your message. What is being communicated to your audience? Write genuine handwritten thank you notes to your customers. This was the most influential piece of advice I took away from Dale Carnegie the first time I read ‘How to Win Friends and Influence People.’ Dale Carnegie loved genuine handwritten notes, and so does anyone who receives one. Even in the Internet era, you can’t beat the personal touch of a handwritten note. Reach out to bloggers in your industry and let them know you’d love to give them an interview. Volunteer to be interviewed by a local reporter. Reach out to be a guest speaker on a local radio talk show. Provide some compelling content to their audience and you’ll be rewarded. Interviews have the power of leveraging someone else’s audience to promote your own product or service. Sites like Help A Reporter Out can be useful in getting your message out. Your business card is the most classic way to brand yourself, your business or your service. They’re inexpensive and portable. Always keep a few of them on you, include them with every handwritten note you send out, and give them to contacts you meet as you move about your day to day life. If you don’t already have business cards, you can get 500 of them for less than $10 at Vistaprint.com. Be a walking, talking advertisement for your business. Wear a branded polo t-shirt. You’ll look professional, people you interact with will see the shirt, and it serves as a great conversation starter. Everywhere you go, you’ll be advertising your small business – the dentist, little league games, the airport, conferences, coffee shops. Put a logo or decal with your phone number on your car. This can establish a strong presence in your community and will be seen by thousands of people. Advertising in a bus, taxi or train is not as pricey as you might think. You’ll get in front of the eyes of thousands of people on a daily basis. Organize a cookout and serve free food and drinks. Host a free clinic where a professional demonstrates your product or talks to people. Give something to the community for free. Customer service is an art. Zappos termed it "delivering happiness." Don't confuse this with responding quickly and concisely. Excellent customer service is achieved when you've not only answered some one's question, but also put a smile of their face. Your customers should come away from your interaction feeling happy and grateful you were there to help them with their issue. Although this may not be relevant to every business, there are online forums for almost any niche you can think of. Entire communities of people talking about and seeking information on what you do. If you provide them value, they will listen to you. If you become a known member and develop an excellent reputation instead of spamming people about your busines, you will become a trusted source of information. Example: if you sell collector cars and you become well known on one of the thousands of collector car forums, your business will also become well known as you become involved in the community. You don't need millions of dollars to advertise your small business on a small budget, but you will need creativity and effort. You need to be remarkable. And since you don't have a lot of money, you will need to make up for that with a lot of time, effort and creativity. This list of 42 creative ways to advertise and promote your business or product is just a list that will hopefully inspire you. Obviously, you can't try all the suggestions on the list, but hopefully a few will stand out as a good fit for you and your talents. The goal here is to authentically engage in low-cost activities that drive new customers to your business and accelerate growth. Act with courage and hustle because you're the only one responsible for your success. Stay focused on building the best possible business and providing massive value to your audience. If you're great, people will notice and opportunities will appear. Have you had success creatively advertising your small business on a small budget? If so I'd love to hear your story. Originally published October 2013 and updated June 2015. Pretty extensive list. I doubt you with one single promotional technique! Thanks, great advice, all 42 suggestions were right on. I coach small businesses how to do their own publicity and I am sure all of my clients would agree with your suggestions. Putting getting clear on your goals first was the best part, this will reflect on the rest of the suggestions you had. In the case of doing your own publicity know your goal is key. If you are looking for funding, you do one type of publicity, if you are trying to sell more product that leads to another type of publicity. And so knowing your goal continues to keep you focused and insures you get the outcome you want. Thanks again, Edward Smith.